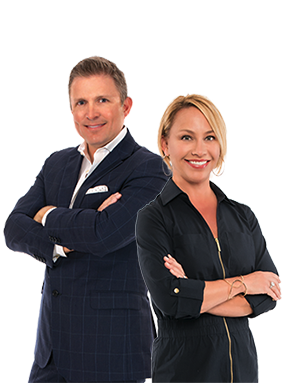 Brad and Shannon Ball are specialists in the luxury waterfront and club community real estate market of the Palm Beaches. Before joining the Admirals Cove Realty Team, Brad was Vice President of The Ball Group, a national new home sales and marketing firm headquartered in West Palm Beach. During his 7 years with the company, Brad was involved in the sale of more than 2,500 luxury homes with gross sales totaling in excess $1 Billion. Brad directed the sales and marketing of some of the country’s most prestigious estate neighborhoods, condominium and golf developments and forged key relationships with some of North America’s premier residential luxury builders, developers and asset managers. Brad graduated from Florida Atlantic University in Boca Raton and spent the next six years after college following his dream to become a member of the PGA Tour. Nearly 20 years ago, after his retirement from professional golf, Brad became a real estate broker and joined Centex Homes where he applied his competitive drive to his 3.5 years with the company. Brad was the recipient of several national sales awards and closed over $100 million in real estate for Centex. Shannon is a native Floridian, and having lived in both North and South Florida, she has a unique appreciation for the paradise she now calls home. A self-proclaimed “political junkie” with a degree in Political Science, Shannon began her professional career working in local government and was the Chief of Legislative Affairs in the City of Jacksonville. Later in her career, Shannon held partnership positions in some of Florida’s most established lobbying firms. Working with a diversity of clients ranging from start-up ventures to Fortune 250 companies, she developed the necessary skills of effective communication and the ability to formulate strategies to get the job done. With an attention to detail and a driven approach to business, Shannon has brought that same work ethic and knowledge to her career in real estate. Brad & Shannon have a passion for our nation’s military and bleed red, white and blue. Together they started the Tipsy Turtle Foundation, a 501c3 benefitting our U.S. Navy SEALs and other special forces operators returning home from the battlefield. They host an annual golf tournament called the Tipsy Turtle Invitational which has grown exponentially over the last eight years to become one of the premier charity golf events in The Palm Beaches.